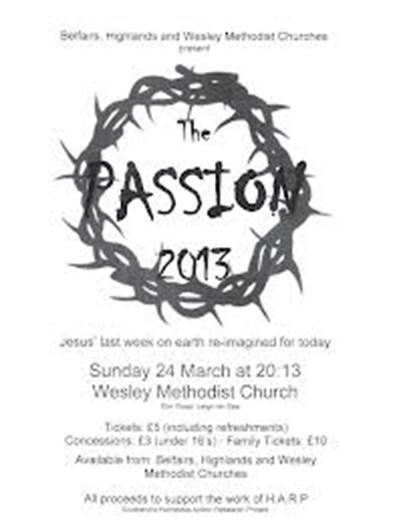 The last Passion Play was at Wesley Church on Palm Sunday in 2013 . Proceeds from t he event supported the work of Southend’s Homeless Action Resource Project. In terms of the script, basing it on the account in Luke’s Gospel, it’s been fascinating seeing what’s included and left out of each gospel; and to try to get into the heads of the various characters to understand the motives behind their actions and imagine what they might say. Sometimes it’s too easy to reduce these characters to goodies and baddies, when, like the rest of us, it’s a lot more complicated. Whether like Pilate it’s trying to keep things under control; Caiaphas, the High Priest, feeling that traditions or the authority of religious leaders are under threat; or Judas, perhaps torn that Jesus was maybe not the sort of leader he had imagined. And Jesus – what must it have been like for him.